From the moment I enter John&apos;s Old School/New Skool Barber Shop in Schwenksville, I know I am somewhere extraordinary. The interior features a host of barber chairs and equipment - as expected - but the décor is a baby boomer&apos;s dream, laden with posters, pictures, artwork, memorabilia, merchandise and signage from the past. A nearby magazine rack stocks a Magilla Gorilla comic book. Bottles of Vitalis, Lectric Shave and other retro grooming potions peek out from behind a row of shaving brushes. A convention of Bob&apos;s Big Boy figurines - each in a jaunty pair of checkered overalls - occupies an entire shelf. An autographed album from former kiddie TV host Pixanne hangs from one wall; and across the shop, an autographed photo of Gene London smiles back at her. Philadelphia Mayor Frank Rizzo takes a stance between two mirrors, via an imposing portrait. Cartoon characters are everywhere: Huckleberry Hound, The Banana Splits, Count Chocula, Mr. Magoo. But what proprietor John Scioli displays most is toys. "We were not rich when I was growing up," he says. "My parents were very traditional Catholics, and any time extra money came into the house, my dad would donate it to a parish in need or to a local family who was hurting. It was a nice thing to do, but it also meant that there wasn&apos;t a lot of opportunity for us to get new things to play with. So as I grew up and acquired the means, I decided to buy every single toy that was denied me as a child," he explains. I sit in the massive barber chair. After he drapes me, Scioli fills his cupped hands with hot foam and gently applies it to my scalp. Straight razor in hand, he begins bringing my head to a glossy sheen. I ask about the collection&apos;s obvious accent on the kid show H.R. Pufnstuf. "I loved that show," he answers. "A grade-schooler, I remember coming home from school every day and watching it in syndication. It works on so many levels. As a kid, it was just colorful and fun. But as an adult, I started to appreciate its trippy outlook and psychedelic colors. It is so full of double-entendres. I find it hilarious, now." Once he has cleared the landscape of my scalp, Scioli applies a cool, soothing balm, gently massaging it in. The scent is a mixture of mint and eucalyptus that I can&apos;t quite place, but it is rich and refreshing. 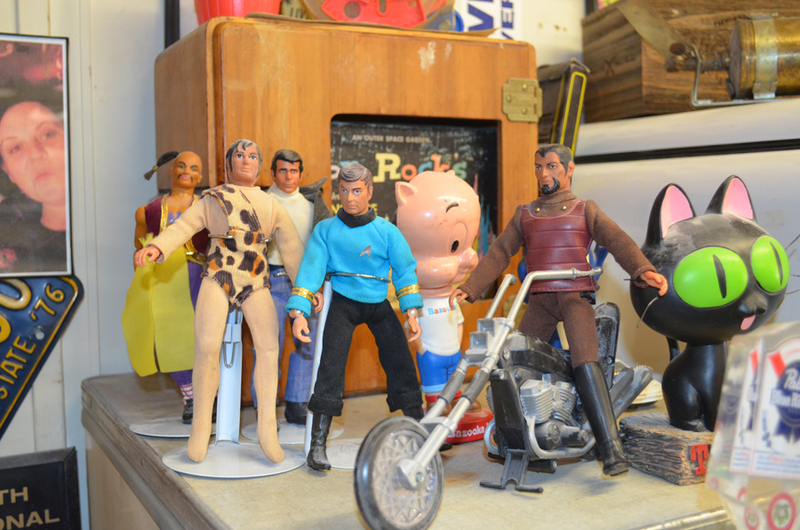 His toy collection grew out of years of frequenting antique shops and flea markets. "I have rules - because what&apos;s the fun of collecting things if there aren&apos;t rules? For instance, I won&apos;t pay more than $1 for a Pez dispenser. And I don&apos;t like buying online. It&apos;s not fun that way," Scioli explains. I am then tipped back in the chair, and again the shave cream warmer whirs beneath the hands of the tonsorial master. He applies peaks of froth to my chin and cheeks and starts the next phase of the shave. When he approaches me with the straight razor, I reflexively swallow, and Scioli laughs: "Everyone does that. They gulp when I get near their jugular." I joke back: "Well, I have seen Sweeney Todd!" As an expert in virtually every man&apos;s hair style trend from the 1920s to the 1960s, Scioli not only preserves the cuts of a bygone era but also instructs colleagues in their intricacies. "I had a barber come all the way from Canada to watch me do a pompadour," he says. My shave is over. A series of hot towels is applied to my face, and Scioli grabs my cheeks and chin and massages them. The grip is firm - as if he&apos;s kneading bread - but the effect is hypnotically relaxing. Following the warm, steamy towels is one that is cold, closing my pores. After one final dose of fragrant moisturizer, the chair is righted, and I am finished. We exit the shop and go around back. Scioli ushers me into what he calls "The Schwenksville Museum of Nostalgia," a small nook where he displays more of his massive toy collection. 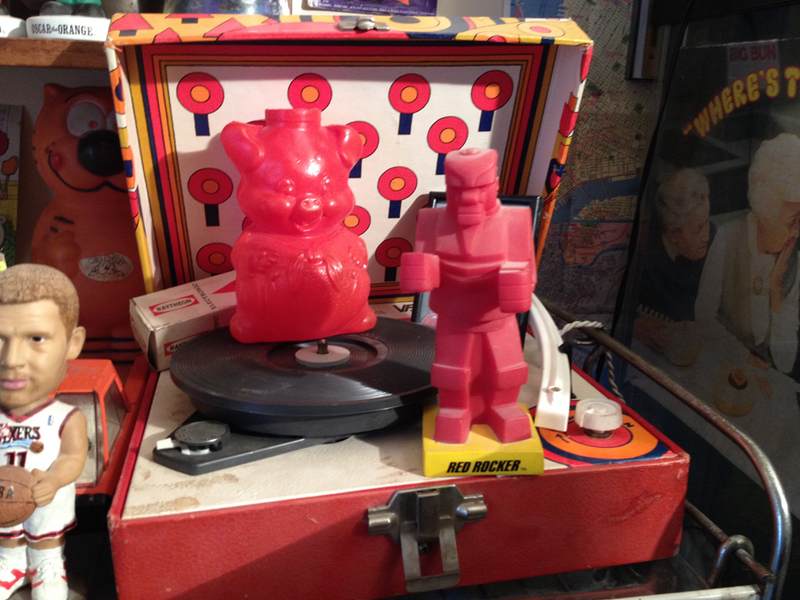 There are plenty of lunchboxes here, as well as action figures, McDonald&apos;s collectible drinking glasses, stacks of eight-tracks and television-themed board games. I spot a pair of framed lobby cards from a virtually forgotten film called Darby O&apos;Gill and the Little People, which my host acclaims as his "...favorite Disney movie of all for how weird and dark it is." Back out front, Scioli sums up his business: "The museum is just a hook. It gets people to know about the shop. This is a place that keeps alive the decades-old forum in which men came together, got their hair trimmed, shared the news of the day and socialized. It&apos;s not a salon. No mannies and peddies. It&apos;s not a chain of hair cutters." To enjoy both his barber skills and his wacky collection, I assure him I will be back. As I drive away, it strikes me that a trip to John&apos;s Old School/New Skool Barber Shop would be the great beginning to a bachelor party. Scioli&apos;s business does have a bit of a man-cave vibe that a groom-to-be and his ushers would enjoy, while getting spiffed up for the oncoming wedding. For additional resources related to a Montco wedding - including hotel venues - see our website.